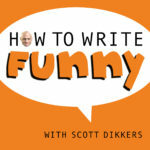 The How To Write Funny podcast is a serious conversation about comedy. TV and commercial copywriter Steve Dildarian enjoyed two seasons of his own funny and critically acclaimed animated series on HBO, The Life and Times of Tim. Scott talks with Jermaine Affonso, a former writer for The Onion who’s now the Editor in Chief of Clickhole, which many have called the funniest site on the Internet. Jerry Rocha, from Dallas, TX, has been performing stand-up for 20 years. He’s appeared on Conan. Last Comic Standing, and his TV special, The Gentleman Jerry Rocha, presented by Gabriel Iglesias, premiered this month on Fuse. Beth Newell founded, with Sarah Pappalardo, the women’s news parody website Reductress. Louie Anderson is one of the most successful stand-up comics of the last 30 years. He created and starred in the animated TV series Life With Louie. He’s written several books, including Dear Dad: Letters from an Adult Child, and The F Word: How to Survive Your Family. For a time he was the host of TV’s Family Feud. With the worst audio quality yet, Scott talks via wax cylinder and copper wire with literary agent Daniel Greenberg, who represents humor writers, comedians, and comedy celebrities. He also discovers new talent in the humor sphere and gets them book-publishing deals.